When folks contact us to begin their inquiries into equipment for catheterization or angiography work, generally, the first question they ask is: "How much does digital cath lab equipment cost?" 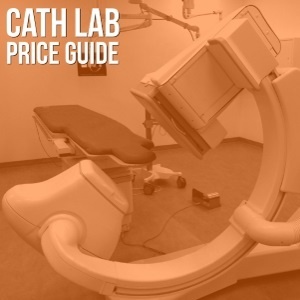 It's a big question, with some big variables at play but, to help those of you on the market begin to build some budget expectations, our cath lab experts have compiled current average pricing for five of the most popular digital cath lab models on the secondary market. Have a model in mind? Click here to get a custom quote for your specific project. The main reasons for price variations are secondary market supply and digital detector size. In the Philips FD series, the detectors are 10 and 20 inches, respectively. The GE Innova series detectors are measured in centimeters and come in at 20cm, 30cm, and 40cm. The age of a given system and of major components like the detector and tube will also be factored in. Differences in detector size are related primarily to the types of studies a system will be used for. Smaller detectors like the FD10 and the Innova 2100 are optimal for cardiac procedures. If you plan to perform run-offs, ablation techniques, or tumor/vein embolizations, a large detector like the Innova 4100 is preferrable. Both the Philips FD20 and the GE Innova 3100 are considered "swing labs"- that is, digital cath lab equipment that is suitable for both cardiac work and a variety of vascular and neurological applications. If you have more questions about digital cath lab equipment, our team is ready to help you select the best system for your needs. Use the button below to tell us about your cath lab project.